There is a group of young adults from church who asked me "tips" on wedding planning. A friend of them is about to get married and they were chosen to the the wedding planner and coordinator. I find it quite funny that they asked for my two cents on their venture. As I churn out one tip after another, I humored them by placing a price tag on each pointer and tip that I gave them. My daughters and I have been "planning" on being a pro event planner for the longest time. We definitely have the flair, talent and connections. However, what we don't have is time. However, for those who want us to plan their event, we would be more than willing to do so as long as we are given ample time. 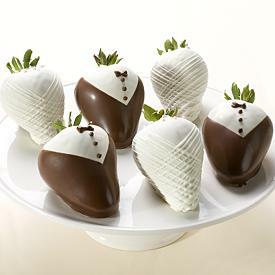 See the Wedding Chocolate Strawberries picture to your right? We could do that!.... or at least try to do that!